Many Arctic expeditions in the 19th century ended with shipwrecks. Probably the best known is Franklin's expedition (1845) which had tragic human losses: as many as 120 people died. Twenty expeditions were organized in order to find and save them, but in vain. The Austrian-Hungarian state, which at that time included also Croatian coast, planned expedition to NE of Novaya Zemlya, and to find the so called North East Passage. This led to the discovery of Franz Josef Land in 1873, a collection of about 85 islands in the Arctic Ocean, now a Russian National Park called Zemlya Franca Iosifa. Ante Zaninovic (from Sv. Nedilja on the island of Hvar). In his diary Julius Payer includes Ante Scarpa from Trieste into Slavonic (Croatian) group, see [Kunicic], p. 40, and according to Kunicic the Croatian crew had 13 members (see p. 2), not 12. Also every Sunday the Croats read parts of Evangel in Croatian (scavet), which belongs to glagolitic tradition, see [Kunicic] p. 38. On Christmas they sang a well known song "U se vrime godista", and remember their customs. The crew had a small library with about 400 books, half of them scientific. And a part of books was in Croatian. For the complete list of names and other details related to this expedition, see here. There were some objections addressed to Karl Weyprecht, captain of the ship, why he chose so many Croats, instead of Tyrol Austrians. He answered that he counts on endurance, discipline and experience of Croatian mariners, and the fact that they do not drink. Very important for success of this carefully planned and dangerous expedition was the presence of eight dogs. The expedition led to the discovery of Franz Josef's Land in the Arctic. 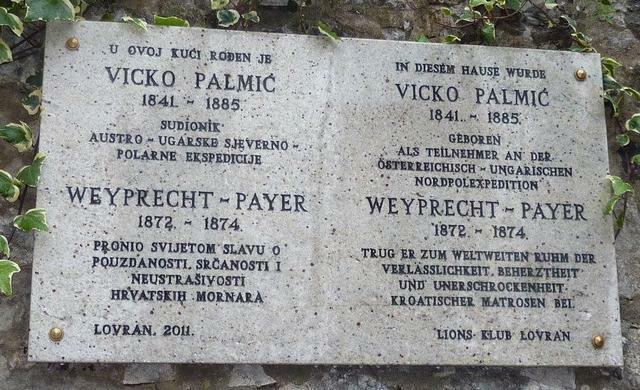 Memorail tablet in honour of Vicko Palmić and Weyprecht-Payer in the town of Lovran, Istrian peninsula, Croatia. Vicko Palmic, Lovran, photo from an exhibition in Lovran 2012. In 1872, when the expedition sailed off from the port of Bremen, weather condition and temperature were particularly severe. A result of ice movement was that the sailboat became wedged in the mass of ice for two years! At that time it was not possible to communicate with the rest of the world as it is today. During these two years the crew, although in extremely difficult situation, performed numerous scientific investigations. The preserved log-book testimonies about very serious and well organized everyday life and work. As the ice moved slowly northward, the mountains emerged, that they named Franz Josef's Land. It had been decided to leave the location of the ship, and carry three auxiliary saving ships on sledges, tugged with dogs and people. In dramatic 800 kilometers that they covered mostly on foot under very difficult conditions, they discovered numerous new interesting places. So today we have places like the Cape of Fiume (= the town of Rijeka, on Croatian littoral), and the Cape of Klagenfurt (a town in Austria). One of participants of this adventure was Eling Carlson from Norway, connoisseur of northern seas. Unfortunately, one member died due to sickness: Oton Kriz from Moravia (today in Czechia). After about two years of stay in the Arctic the ship Thegetthoff was left by the whole crew in the ocean of ice, and 23 people set off back to Europe in three small saving ships. For almost three months people and dogs had to tug boats on sledges, and then during next nine days they had to row until they finally met two russian fishing boats near Novaya Zemlya. As stated in [Kunicic], p. 122, there is no king in the world that would be accepted with such hospitality and joy as those totally exhausted people were accepted by Russian mariners. It is very probable that Croatian mariners were able to communicate with Russians, since Croatian and Russian languages are relatively close. 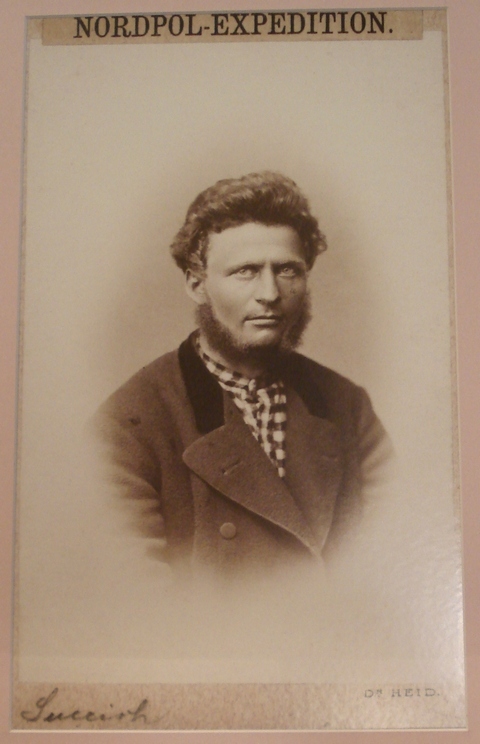 Among all members of the expedition only Petar Lusina (from the island of Cres) knew Russian. Besides his native Croatian, he also spoke English, French and Italian. 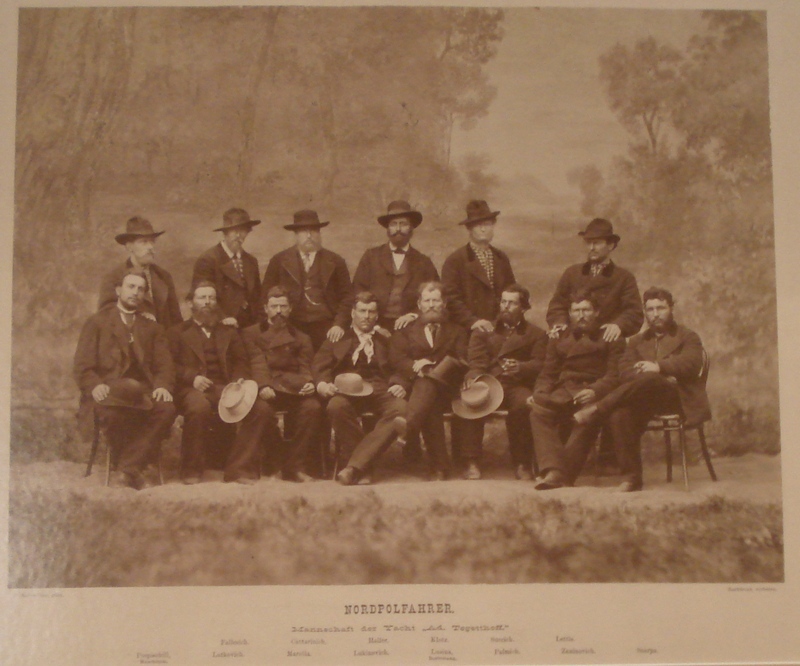 Members of the expedition learned many news that have happened in Europe during two and a half years of their expedition. The two boats took them to Vardoe in Norway, for which Russian mariners have sacrificed four days of their fishing, plus four days for the return. 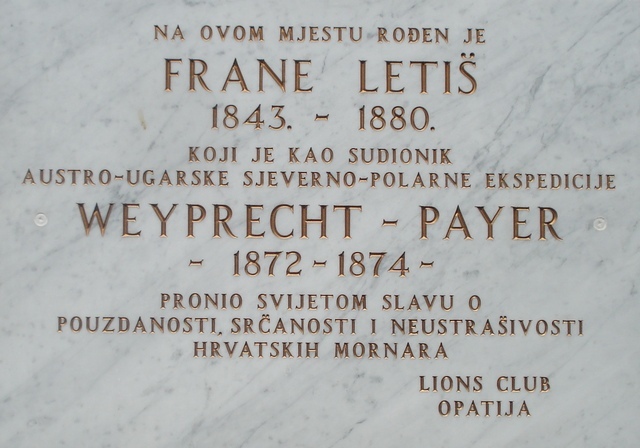 Memorial plaque in Opatija in honour of Frane Letiš, member of the team, was born in this town. Upon successful arrival to Europe, with help of Russian and Norwegian navy, members of expedition reached Hamburg. In Vienna a glorious welcome was organised, and all of them obtained honorary citizenship in Austrian-Hungarian state. A grand "banchetto" was organized in the Croatian town of Volosko near Rijeka. The overall expenses were such that the expedition ended with +17.61 forints, which we know from a very detailed and pedantic final account. Among numerous financial supporters of this daring exploit was Dora Pejacevic , distinguished Croatian composer. It is interesting that experiences of this expedition were important in the preparation of Amundsen's expedition to Arctic about 30 years later. Croatian descent of half of the crew was not even mentioned in the existing literature available in German, English, and Italian. 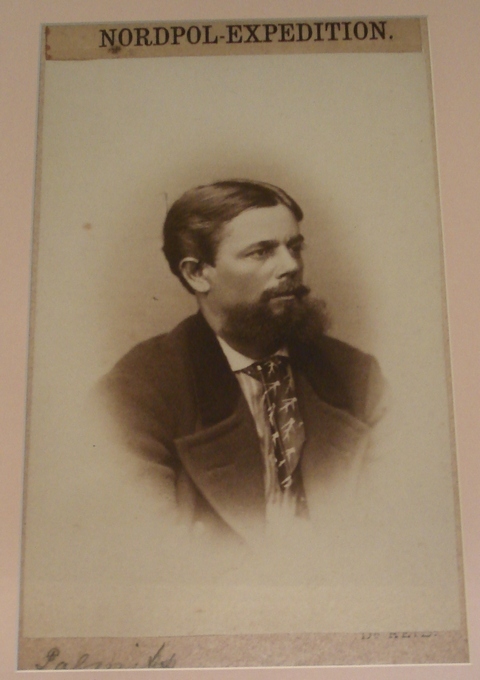 In Croatia itself, the expedition was described by Eugen Kumicic. Ivan Samanic, Josip Baretincic, Anton Mikacic, Anton Lukinovic, Jakov Succic, Tomas Diminich. For the remaining names of the crew and other details see here. FRANZ-JOSEFS-LAND -.-: ÖSTERREICHISCHE NATIONALBIBLIOTHEK: 100 Jahre Franz-Josefs-Land. Zur Erinnerung an die Entdeckungsreise der Österreichisch-Ungarischen Nordpol-Expedition 1872-1874 unter Julius von Payer und Carl Weyprecht. Katalog der Ausstellung 1973. Mit 24 Taf. Wien, o.V., 1973. Okart., g.e. XII, 128 pp. It was Mr Miljenko Smokvina from Rijeka who noticed from the names of members of the crew that many of them are Croatian. After painstaking study that he undertook in 1990s, he discovered many new interesting details about these brave Croatian mariners. I express my deepest gratitude to Mr Miljenko Smokvina for his kind help during the preparation of this web page, and also to Matica hrvatska for having organized very interesting lectures about history and culture of the city of Rijeka, presented by members of Matica hrvatska Rijeka in April 2000 in Zagreb. 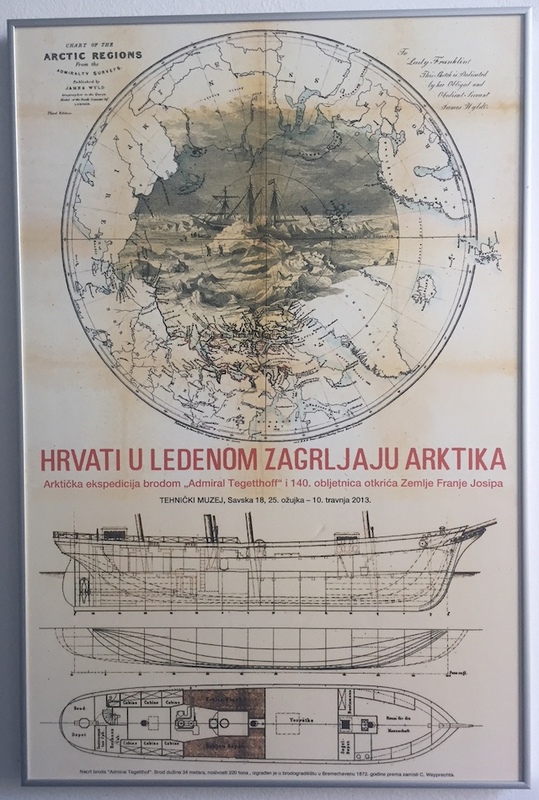 Pomorski i povijesni muzej Hrvatskog primorja u gradu Rijeci niti ne spominje Arktičku ekspediciju. Kako je to moguće?